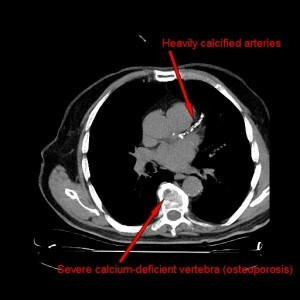 Heart disease and osteoporosis: Same problem, different place? **People with more osteoporosis (thin bones) are more likely to have coronary disease and heart attacks. 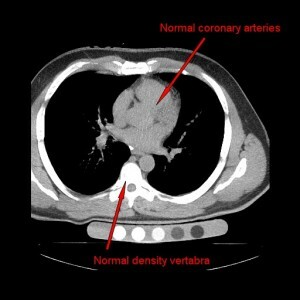 They also tend to have higher heart scan scores (more coronary calcification as an index of atherosclerotic plaque). In other words, regardless of which way you tackle the issue--osteoporosis first or heart disease first--it leads to the same conclusion: Both conditions are somehow connected. A study of 2,500 postmenopausal women revealed a four-fold greater risk of heart attack in women with osteoporosis (Tanko LB et al 2005). A University of Illinois study showed that heart scan scores in women with osteoporosis averaged 222 (optimal is zero), while women in the same age group with normal bone density had far lower average scores of 42 (Barengolts EL et al 1998). With this relationship in mind, take a look at this graphic demonstration of the potential close relationship of osteoporosis and coronary plaque. The first image is a heart scan is from a 46-year old man and shows normal coronary arteries without calcium and normal density of the vertebra (a common and reliable place to measure bone density). The second image is from a 79-year old man with both severe coronary calcification (and therefore severe coronary disease) and severe osteoporosis. It makes you wonder if the disordered metabolism of calcium through vitamin D deficiency allows transport of calcium away from bone and into coronaries. This has, however, been shown to not be the case. Instead, they are separate processes, each under local control, but sharing a common pathophysiology (causative factors). There are some clinical data to back this up. Greater degrees of both coronary calcification and osteoporosis are found in those with lower blood levels of vitamin D (Watson KE et al 1997; Zittermann A et al 2007). However, a lot more validation will be needed to confirm the connection. An intriguing question: Would the 79-year old still look like the 46-year old had he begun increasing his vitamin D intake at, say, age 40?